Last week saw the culmination of the Quebec Climate Action Camp, the most recent in a series of similar events around the world. Climate Camps look different in different places, but the general idea is to bring together like-minded people from around a region to build common strategies, share skills, and take ACTION! The Tar Sands have been a focal point this year; in the UK Climate Camp brought together activists challenging the Royal Bank of Scottland’s investments in the Canadian gigaproject. Here in Dunham, Quebec, climate camp was set up to challenge a pipeline coming through this community. The proposed pipeline is called the Enbridge Trailbreaker project, and would bring dirty tar sands bitumen to Montreal and then down to Maine, eventually ending on tankers heading to refineries in the Gulf Coast. The camp brought together activists from across Quebec, Ontario, the Northeastern US, and beyond, to learn about the intersections of climate and social justice issues, and plan out how to best work together in the coming year. Participants cooked, fed, and set up camp outside and were able to build lasting relationships between various communities to talk about how to build a climate movement. Resistance to tar sands projects has been growing in Canada and people are taking action locally to end the addiction to fossil fuels and the injustices facing communities because of the dirty industry. The two-week climate camp ended with a march to the proposed pumping station for the pipeline. 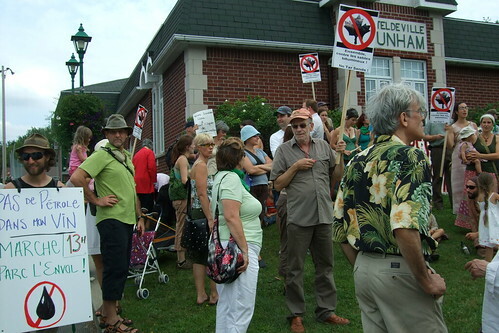 Local community member and climate camp participants rallied at the proposed site. “Our objective is to unite in order to act on the root causes of climate change. It is the right time to denounce and block the Trailbreaker project. Local communities and ecosystems cannot afford more oil spills, like that in the Gulf of Mexico.” says Pierre-Olivier Parent, a Climate Action Camp organizer. Moments like this are just another signal of increasingly mobilized action-oriented groups who are supporting communities resisting point-source fossil fuel destruction. A couple days ago in the Bay Area, 150 people took action on BP, Chevron, and the EPA, with 26 participating in civil disobedience. Its an exciting moment – lets keep building. Last fall I went on tour with Propagandhi to recruit people to join a campaign to stop the Tar Sands. We created this video to connect with their fans and get them to sign up. Flooding in the Philippines yesterday displaced over 600,000 people. As if we didn’t need more of an urgent call to solve the climate crisis. Increased intensity of flooding is among one of the may well-documented impacts of global warming. The implications have hit our organizing here at the UN in Bangkok too – as some activists had to go to support their families amidst crisis. 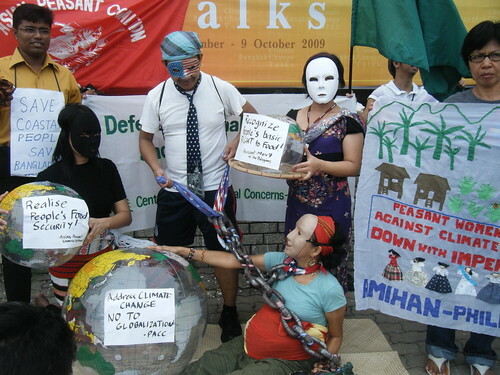 But Filipino groups are still here in full force, emboldened to call for the solutions their communities need – this morning The Peasant Movement of the Philippines and the National Federation of Peasant Women in the Philippines held a demonstration in front of the United Nations Climate Change Negotiations in Bangkok. 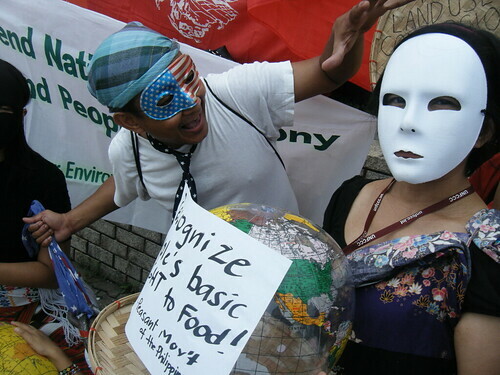 With vivid street theater, the groups called to abandon false solutions to climate change – such as biofuels. Their calls for climate equity in negotiations were echoed by even more demonstrators today from Jubilee South and many others, calling on rich countries to pay their ecological and climate debt to the rest of the world. 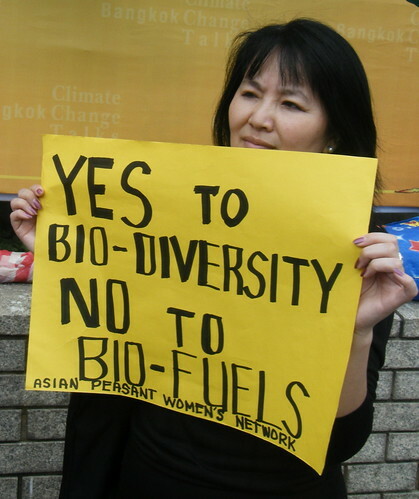 Activists from Thailand, Nepal, Philippines, Malaysia, Pakistan, Indonesia, Africa, and Latin America mobilized to push Northern countries to recognize their historical and disproportionate contributions to climate change, and the disproportionate negative impacts suffered by the Global South. This concept of climate debt is increasingly gaining traction among international civil society, flipping on its head the idea of the debt owed by the South to the North from loans from international finance institutions. As civil society groups call for financing and compensation for the averse affects of climate change for affected peoples, delegates inside the UN continue to debate on our 3rd day of the climate talks. The pressure is on, and the 600,000 people displaced in the last day only add to the urgency. Rainforest Action Network drops Seventy-Foot Banner Over Niagara Falls to Welcome Prime Minister Harper to the U.S.
update: video below, and climber interview here. Before dawn this morning, a small team of climate and Native Rights activists rappelled from the US observation deck at Niagara Falls. 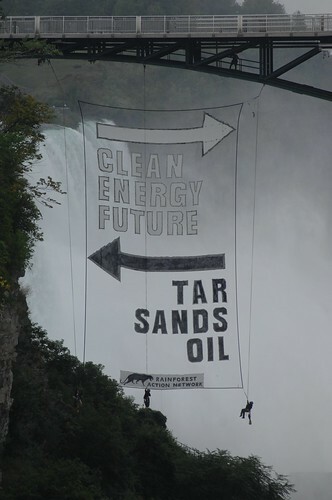 Dangling hundreds of feet above the ground, they sent a special welcome message to Canadian Prime Minister Stephen Harper ahead of his first official visit to the White House to push dirty Tar Sands oil. Not that he’s feeling so welcome anyway. Obama limited the meeting to just one hour. While some have called it a slap in the face, Aides say Harper will turn the other cheek. “The economy, and the clean-energy dialogue,” one aide told the Globe and Mail, “will dominate the discussions.” Obama needed to dodge controversy over oil imports from Canada’s tar sands in the midst of the Climate Legislation debate. Harper needed a story to go with his photo-op. During Harper’s first official trip to meet Obama in the U.S., the two leaders are expected to discuss climate change and energy policy ahead of the upcoming G20 Summit. Canada supplies 19% of U.S. oil imports, more than half of which now comes from the tar sands, making the region the largest single source of U.S. oil imports. The expansion of the tar sands will strip mine an area the size of Florida. Complete with skyrocketing rates of cancer (by 400%!) for First Nations communities living downstream, broken treaties, toxic belching lakes so large you can see them from outer space, churning up ancient boreal forest, destroyed air and water quality, the tar sands have been called the most destructive project on Earth. Tomorrow’s visit to the U.S. by Prime Minister Harper is the latest attempt by Canadian Federal and Provincial officials to lock in subsidies for 22 new and expanded refinery projects and oil pipelines crisscrossing 28 states, which would transport and process the dirty tar sands oil. Many are concerned that Prime Minister Harper wants to protect the tar sands oil industry from climate regulation, even though it is one of the fastest growing sources of greenhouse gas emissions in Canada.